Please do click on the image to enlarge it and really take it in. An Elemental Mixology alumna is now brand ambassador for Pernod Absinthe. When she first took that position, I told her that she should instruct Pernod-Ricard to restore the pre-ban formula Pernod Fils absinthe and drop their then-current ‘inspired by the original’ stuff. In fact, the undesirable stuff is still current – in a sense. I still see bottles of it waiting in vain on liquor store shelves. My alumna told me that she had been told that that is exactly what they had planned. That was a couple of years ago. Now here this is. This was quite a complete promotional kit. There is lots of information about the painstaking work to re-create the pre-ban distillery. There are even samples of the botanical ingredients used in making this absinthe and a wood-encased thumb-drive full of information. 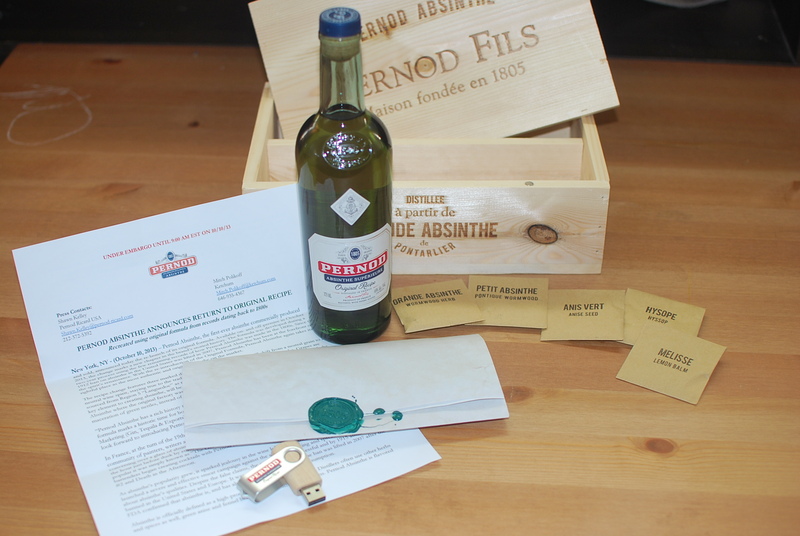 Some of that information can also be found at the Pernod Absinthe ‘back to the roots’ website. But, enough about that. My favorite absinthe since 2006 has been Jade Absinthe Edouard (now called Esprit Edouard). There is really no way for me to judge the return of the legendary original recipe Pernod Fils, except by comparing it to Edouard. 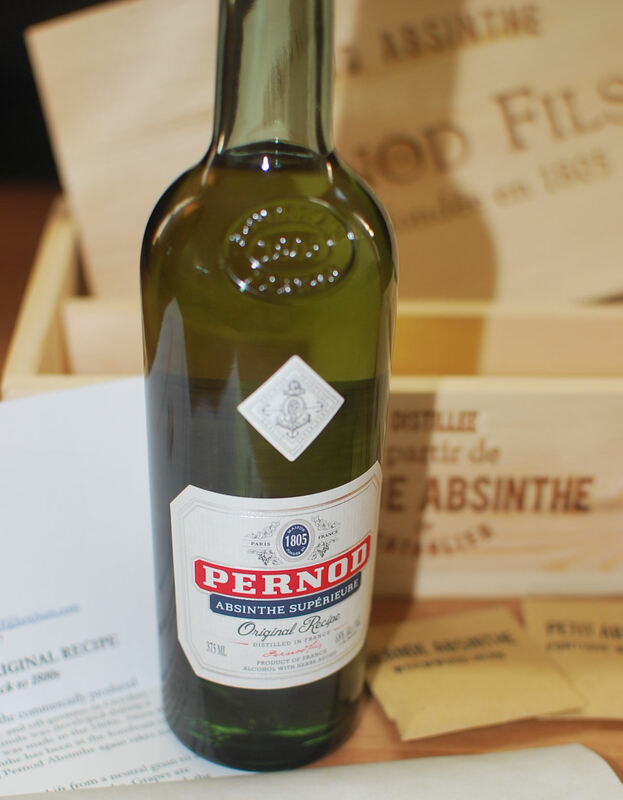 In appearance, the Pernod is just a little paler green than the Edouard. When I smelled it, Pernod promised me that the drinking would be just as memorable a moment as when I first tasted Edouard. When I tasted it neat, I knew instantly that I liked it – a lot. I just couldn’t be sure if I liked it as much as Edouard or not. That, alone, meant that the new-old Pernod is a success. I opened my Edouard and tasted it neat, also. These two are rather different, but both are firmly within the range of flavor that I expect true absinthe to carry. I think that I may actually like the returned Pernod Fils better than Edouard, but it will take some time and further drinking for me to be sure of that. In the meantime, I can heartily recommend it. Just be sure to avoid all those bottles of the previous incarnation of Pernod absinthe still found on liquor store shelves. Make sure the words “original recipe” appear on the bottle before buying it! Next > Elemental Mixology 2014 Edition – Shipping Now!